Has Hate Become The Ideology Of The GOP? There is nothing new about hatred in this country. We have seen it rear its ugly head throughout our history. Hatred has manifested itself in bigotry against religious groups, nationalities, races and differing sexual orientations. We have seen it play itself out in commerce, housing, education and basic American freedoms. Our national response to these issues came in the passage of the Civil Rights Act of 1964 and the Voting Rights Act of 1965. While I recognize that behavior and acceptance lag behind the passage of laws, I would think that 50 years is long enough for the acceptance and behavior to catch up. However, the events of the past few months, combined with the behavior of the GOP over the past few years causes me to question that this country is over its love affair with hate. Naturally, the events in Ferguson and Staten Island stand out as examples of the worst kind of racism, reminiscent of the Old South. However, when we combine that with the anti-immigration movement, the anti-gay marriage movement and the successful efforts on the part of many GOP-controlled state legislatures to repress voting rights, it moves well beyond racism into simple hate and bigotry. There is no mystery about which party is behind these efforts, but it doesn’t stop there. The many states that have refused to expand Medicaid benefits to the poor are controlled by the GOP. The efforts to reduce unemployment benefits to the long-term unemployed as well as efforts to prevent an increase in the minimum wage was led by the GOP. Not surprisingly, to stay with the theme of the rich get richer etc., efforts to prevent the loss of tax breaks to the rich were led by the GOP. There is even a bill being presented in the state legislature of Oklahoma by a Republican that will outlaw the wearing of a hoody. Do you detect a theme here? Hatred and bigotry are learned behaviors. They are passed from generation to generation. 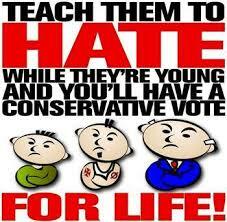 There was a famous song in the Broadway show “South Pacific” that talked about having to be taught to hate. We are not born to hate. Yet, throughout history we have seen the bloody results. You would think that the Holocaust would have provided a searing object lesson about what hatred can do to a nation and a people. You would think that the centuries old sectarian battle between the Sunnis and the Shias would provide an example of the high cost of hatred. If not these examples, certainly you would think that the barbaric murders committed by ISIS over the past couple of months would provide reasons for us to rethink our attitudes and behavior toward each other. But, there is no let up as the GOP prepares to move its hatful agenda through congress. Ironically, after their losses in 2012 they talked about the need to reach out to the African-American community and the Latino community so that they could open the party and make it more diverse. But as we all know, actions speak louder than words, and the GOP is as narrow and hateful and bigoted as ever. Let’s not forget that the South became solid for the GOP after the Democrats passed the Civil Rights Acts and the Voting Rights Act. Conservatism does not require one to be hateful. It is only a hateful ideology when those who have taken control of the party see it necessary to interpret it that way. Because of this it has literally become the currency of the present GOP. It is unfortunate that the major sources of funding for the GOP feel that supporting this ideology of hate is a winning proposition for them. The next two years will be challenging for all who feel that freedoms and liberties should be extended to all who live in America. It is time to beat down hatred once and for all. Previous I Say Good Riddance To 2014, And Welcome 2015 With Hope. Next Is It Time For Radio Free America?